There's a certain charm to simplicity, whether it's Jamie Oliver scaling back TV cookery as The Naked Chef, or Janet Jackson scaling back her career as The Naked Halftime Show. Dialing back their style for a new summer drop, Super Sunglasses. 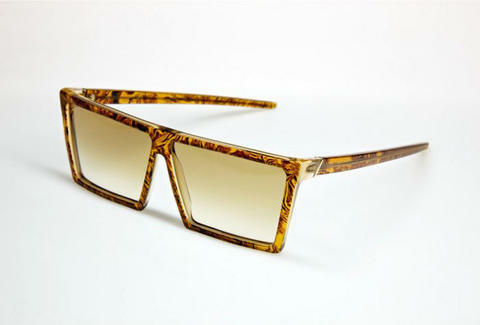 After making waves with stylishly stunning 80s-style frames, Italian shades artists RetroSuperFuture are now toning down their own glare with the purposefully minimalist "Summer Safari" collection, whose clean lines embody a "return to a classical and more elegant point of view" (what's more elegant than going to someone else's country and shooting their animals?). Sporting acetate frames and mostly brown lenses, the newness kicks off with the rounded "Basic Shape" boasting ornate wood-like patterns on the frame; and, paying homage to late 70s designers like Marcello Gandini, a geeky-cool, trapezoidal, jungle-foliage-evoking pair called the "Super W", presumably not named after the hero whose only weakness was Condi-nite. Moving in an "avant garde" direction, there's the "Andrea Savanah Striato", with darker, crisscross-lined tortoiseshell half-frames; and the more mottled, black-lens "Flat Top Ghepardo", which translates as "cheetah whose best opportunity for career advancement was joining the army". Older, less understated models range from the 3-D-style "Sideviews Havana Glitter" and its awesomely unnecessary arm panel lenses, to the colourfully translucent-lens'd Crystal Flash -- which thanks to all that is holy is not the reason Billy's had to scale back his career.